Q. What image or digital format is best for medical, legal or general office files, charts, papers, documents when scanning etc.? Because most legal medical or general offices view images that are scanned in its original paper size or scale, Pixel based is best suited (a few cents per page). Converting to vector is also not cost effective (hundreds of dollars per page) and is mainly used for large page formats, billboards etc. Q. What are image formats? Image formats are standardized ways of storing and organizing digital images. There are two basic formats Pixel based (raster image) or Vector based. Pixel based (looks like dots) are arranged in a grid that has columns and rows. If you think of a square inch the amount of pixels in that area represents the resolution or DPI (dots per inch). Each pixel consists of numbers representing magnitudes of brightness and color. Vector images or graphics are generated from computer programs like CAD (computer aided design) software and is the use of geometrical primitives such as points, lines, curves, and shapes or polygon(s). These are all based on mathematical equations, to represent images in computer graphics. Q. Why do image formats make a difference when scanning? Pixel based (raster images) loses clarity when magnified or scaled, while vector-based images can be scaled indefinitely without image degradation. Q. 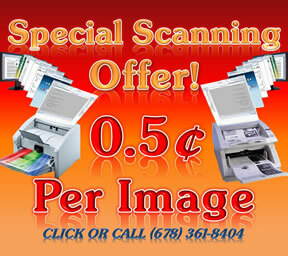 What type of pixel based image scanning is best for legal, medical or general office use TIFF or PDF? When you scan papers or documents to a TIFF format it is flexible, and can accommodate multiple images and information in a single file through tags in the file header. This format also accommodates vector-based clipping paths, PDF files can't easily do this. Little or no compression is lost when TIFF files are edited and resaved. This is an important feature when using the file format for archival or data asset management purposes. As noted below you can alter PDF much easier than TIFF files because PDF files have the original font style, this can be a security risk. If you are putting text in the images, the PDF is a better choice. The answer is "it depends on how you use your images"
Q. What is TIFF file? TIFF stands for Tagged Image File Format. CALS is the Government version of TIFF. This can be a CAL extension, a CG4 extension, or a TG4 extension. Q. What is a PDF file? • Index a PDF for complex searches. Study after study shows that it takes an average of six minutes to pull and re-file a chart. This can cost you as much as $35,000 a year. Read more..
Studies show that an Electronic Document Management System, or Electronic Medical Record System provides the best path to HIPAA compliance. Read more..
A physician can receive up to $44,000 under Medicare and $63,750 under Medicaid, while a hospital can receive millions of dollars.